The similarities between the Fall of the Soviet Union and the upcoming Fall of the United States are shocking. Allow us to examine Chernobyl and the American equivalent, the Gulf of Mexico. In essence, both were the very extremely unlikely occurrences in the energy sector, without which key ingredient, nothing in a modern society functions. Both cost lives, first in the short term, though the American count was much lower, and will in the long term, though the American version, will be much much higher. Both contaminated a huge area of land and cost the local economies and national economies dearly. And at this point, my critics will say that my roof has slid off. That I have gone bonkers. How can these two of the greatest or worst man-made disasters be similar? Well, it is not just the physical aspect of this that we shall consider, dear readers, but the psychological-moral aspect that everyone in the American press is ignoring but that will become very visible over the coming months and short years and which is already in effect in the hearts of those oppressed by this disaster and the government behind it. Both of these disasters were first and foremost man-made. While natural disaster can not be blamed on government and only the botched responses, they rarely, those botched responses, topple societies and governments. People tend to be more forgiving, since after all, who could have foreseen that the storm would go there...or do that...to that level...or the earth quake... But not so for man-made disasters, where even if by total accident, the view is, it should have been absolutely preventable. The absolutely half arsed and botched response of the Soviets and the Americans has shown both governments to be 1. absolutely incompetent and unable to defend the needs and livelihoods of their citizens; 2. to be absolutely unfeeling to the plight of the millions directly affected by this; 3. to be extremely heavy handed in the inadequate response, further degrading or destroying the lives of the victims; and 4. to attempt to lie and cover up their own incompetence from their people. Unfortunately, with disasters of this wide range, that is rather difficult to accomplish, especially as in the Chernobyl cloud and the Gulf oil slick they both go international, invading and affecting the areas of other nations and destroying their economies too. All this, of course, has the most acidic effect on the moral of the people. Both incidents came as both nations were/are slouching and suffering economically, politically, and morally. Both were already in question of survival. In America, talk of succession is now almost common day, especially in the occupied Confederacy, Kingdom of Hawaii and the annexed Republic of Texas. This will only reinforce the already prevalent feeling that the powers that be do not care about the people or their suffering. Local politicians will be quick to feed upon this malcontent and will grow their power on the concept of, at best, more decentralized and autonomous power from the central authority or at worst, direct succession. In the crumbling Soviet Union, five years passed between Chernobyl and the final collapse of the State. In America, the process will be much faster. Why? Because, unlike the Americans, the Soviets at that point understood their economy was collapsing and were doing what ever possible to preserve it. Though misguided they were under few illusion of what was happening. The Americans are ideologues pure and simple, something the Soviets, at that point, were not. Furthermore, unlike the Soviets, the absolutely and insanely heavy handed action of the American regime is beyond logical comprehension, as all ideologues usually are. To be equivalent, the Soviet Union would have had to ban all nuclear power plants nation wide, which is equivalently, what Obama and his lords have done. 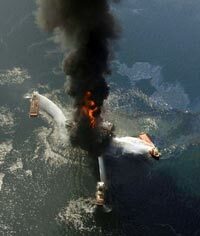 The response was to ban all drilling off shore in America. Never mind that 38% of American oil comes from there, but it will also cost 150 to 200 thousand jobs, from the rig workers to the manufacturing industry producing parts for the service companies that work for the oil companies. Worst, most of this will hit right in the very states where the oil is destroying fishing and tourism, thus one more blow to already desperate and rather angry people. That this so happens to be the territories of the Republic of Texas and the Confederacy, will only inflame the drive for moral, economic and political freedom from the oppressive and occupational government in Washington.